PRODUCT DESCRIPTION: Cellulose based bait which is used inside the Termite Bait Station to attract termites. 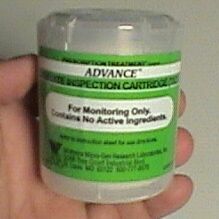 Inside each station there should be a Wood Base with one of these Inspection Cartridges sitting on top of the base. Once inside the station, termites will find their way into this cartridge which they will aggressively feed upon. As soon as you find termites in a station, this cartridge should be replaced with one of our Bait Cartridges. The Inspection Cartridge won't last as long as the Wood Bases. Expect them to last 3-6 months under normal conditions; longer if it's dry and less if it's moist and humid. RATE OF APPLICATION: 1 Cartridge per station every 3-6 months; replaced them twice a year. We have been ordering the Advance Termite BS Insp. Cart for years! Excellent way to save money! BugSpray makes creating a bug free home and yard EASY!!! We have not had a termite problem yet!